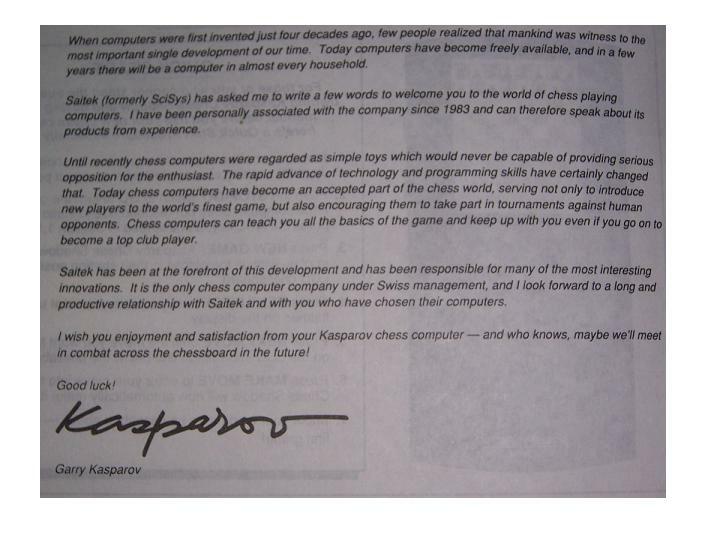 Saitek Kasparov Chess Shadow. This is a hand held model endorsed by Gary Kasparov, thus the name. You play by using the main 5 keys to select the piece you want to move and where you want it moved to. Interestingly, there are some shortcuts, or common moves that are pre-programmed and you can easily execute them with just a couple of keystrokes. You can also get information about what the computer is thinking, i.e., the analysis, take back moves (up to 6 ply), show the legal moves for any piece and you can adjust the contrast and turn the sound off. It is capable of underpromoting. There are levels for fun play and problem solving.